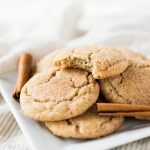 Homemade snickerdoodle cookies are soft, chewy and coated in cinnamon sugar. Bake them for Christmas or when you’re craving a sweet treat! I still can’t believe it has taken me this long to post my homemade snickerdoodle cookies. I was so caught up in my pumpkin snickerdoodles, that I completely forgot the good old fashioned ones! 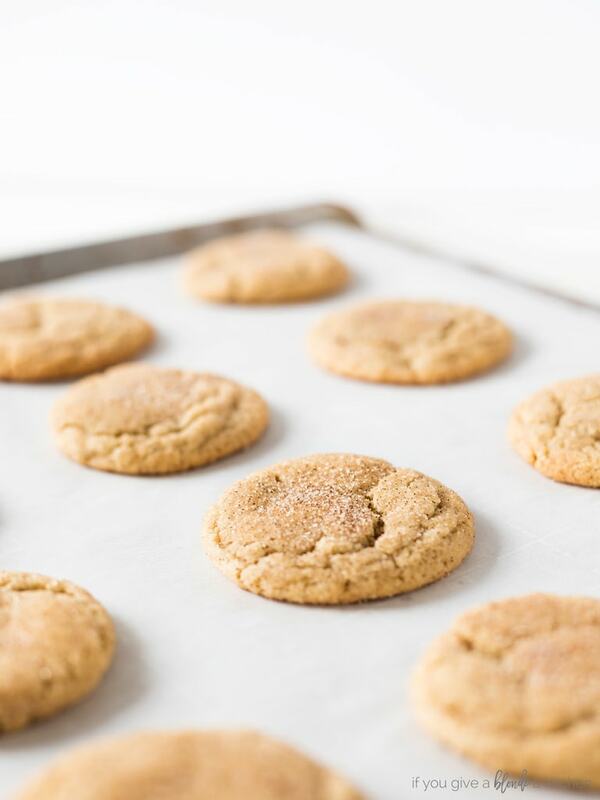 If you ask me, snickerdoodle cookies are a classic. Every baker should know how to make them and keep the recipe handy for when the mood strikes. Yes, there is such thing as a snickerdoodle mood. 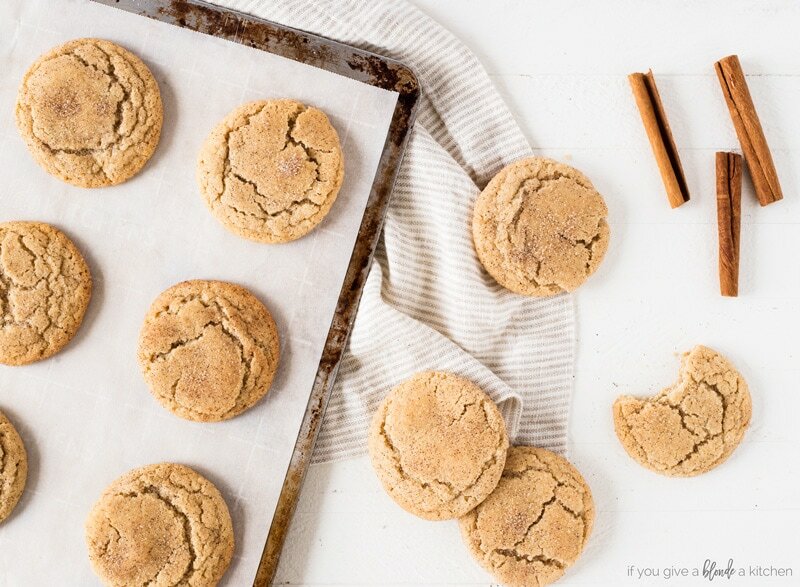 It’s when you’re craving cinnamon sugar and a thick, chewy cookie to bite into. 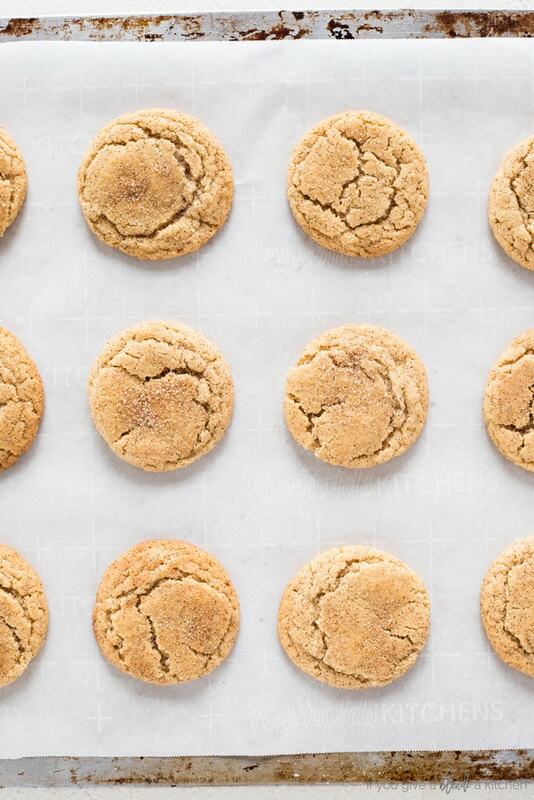 The key to a good snickerdoodle is having a soft, but chewy consistency. To obtain this, you have to use enough flour to act as a leavener, but also slightly under bake the cookies. Yes, take the cookies out when the center is still pretty soft and the edges are barely set (about 10 minutes). Don’t worry, they are still safe to eat. The inside will be extra chewy and soft—yum! The classic snickerdoodle ingredient is cream of tartar. It adds a tangy flavor that keeps your taste testers guessing. In a pinch, you can substitute with white vinegar or baking soda, but it won’t have the same effect. As if biting into a soft and chewy cookie isn’t enough, snickerdoodle are coating in cinnamon sugar. Yep, that’s the craving I’m talking about. It makes each bite simply melt in your mouth. I like making snickerdoodle cookie dough before the holidays and freezing it. It’s a crowd pleaser so I know it will go to good use when Christmas rolls around. If you choose to freeze the dough, wrap it in plastic wrap securely and when you’re ready to bake, defrost the dough in the refrigerator overnight. Then bring the dough to room temperature and roll into balls to bake. Make sure you have your cinnamon sugar mix ready when you bake the cookies! It makes all the difference. 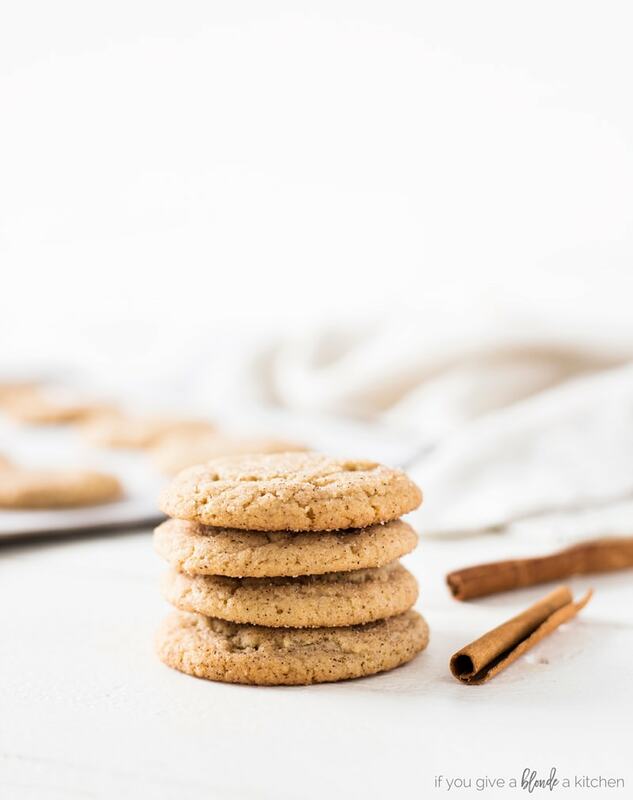 Whip up a batch of homemade snickerdoodle cookies when you’re in the mood. 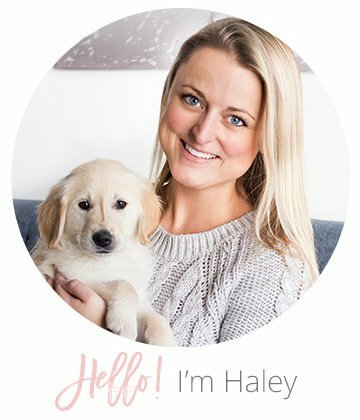 They are a fan favorite so be ready to share! 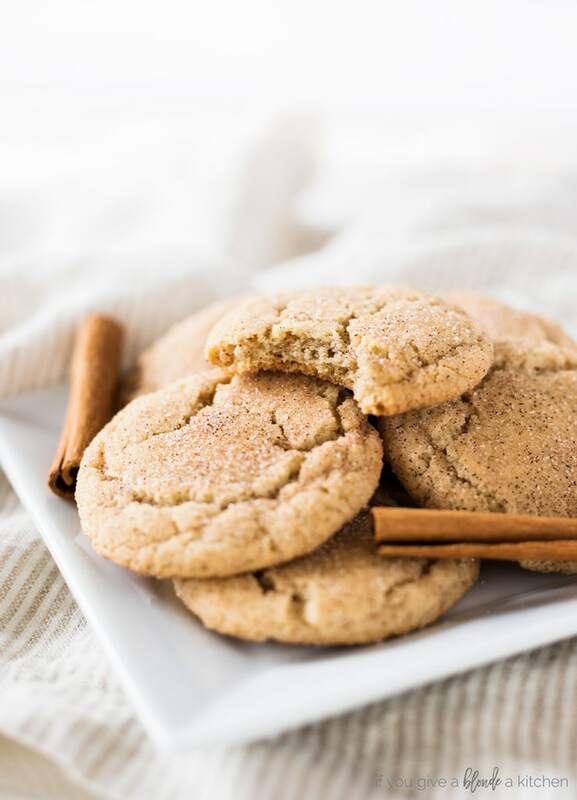 Homemade snickerdoodle cookies are soft, chewy and coated in cinnamon sugar. Bake them for Christmas or when you're craving a sweet treat! Preheat oven to 375° F. Line a cookie sheet with parchment paper. Set aside. In a large bowl, whisk together the flour, cream of tartar, baking soda, cinnamon, and salt. Set aside. In the bowl of a stand mixer (or using a hand mixer), beat the butter and sugar together on high speed until light and smooth, about 2 minutes. Add the egg and vanilla extract. Beat on medium speed until incorporated. Scrape down the sides of the bowl as needed. With the mixer on low, slowly add the flour mixture to the bowl. The dough will be thick. Prepare the topping by whisking together the sugar and cinnamon in a small bowl. Scoop about 1.5 Tablespoons of cookie dough and roll it into a ball. Roll the dough ball in cinnamon-sugar topping. Repeat with remaining dough, placing each dough ball 3 inches apart on the baking sheets. Bake cookies for 9-10 minutes or until the edges are set and the centers are soft and puffy. Cool cookies on the baking sheet for 5 minutes then transfer to a wire rack to cool completely. 1. Store cookies in an airtight container at room temperature for up to a week. 2. Cookie dough freezes well for up to a month. Defrost in the refrigerator then bring to room temperature.